Control names and values are escaped. Space characters are replaced by `+’, and then reserved characters are escaped as described in [RFC1738], section 2.2: Non-alphanumeric characters are replaced by `%HH’, a percent sign and two hexadecimal digits representing the ASCII code of the character. Line breaks are represented as “CR LF” pairs (i.e., `%0D%0A’). The control names/values are listed in the order they appear in the document. The name is separated from the value by `=’ and name/value pairs are separated from each other by `&’. 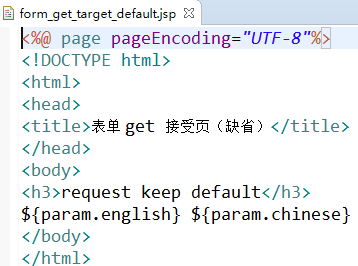 If the method is “get” and the action is an HTTP URI, the user agent takes the value of action, appends a `?’ to it, then appends the form data set, encoded using the “application/x-www-form-urlencoded” content type. The user agent then traverses the link to this URI. In this scenario, form data are restricted to ASCII codes. If the method is “post” and the action is an HTTP URI, the user agent conducts an HTTP “post” transaction using the value of the action attribute and a message created according to the content type specified by the enctype attribute.